Sri Lankaâ€™s Hambantota port is officially Chinaâ€™s own port, for 99 years. Thatâ€™s according to a landmark agreement signed early last week, which gives China Merchants Ports Holdingsâ€”an arm of the Chinese government--70 percent stake in the Indian Oceanâ€™s prominent outpost. The Hambantota port expansion begun with loans from China. But when Shri Lanka could not pay back the loans, Beijing converted these loans to equity, in essence turning Sri Lanka into a "semi-colony," as was the case with Chinaâ€™s own Southern ports after she lost a war with European powers--though in a subtle way. The taking over of Hambantota by Beijing is bad news for both Pakistan and India -- for different reasons. For Pakistan, the deal will serve as a model for the future of CPEC (Chinaâ€“Pakistan Economic Corridor), a huge transportation network connecting China to the Arabian Sea at Pakistanâ€™s Gwadar Port. Like Hambantota, CPEC started with loans that will eventually be converted into equity, as it seems very unlikely Pakistan will ever be in a position to pay them back. This means that Beijing will one day own CPEC, and collect tolls from every vehicle that makes use of it. For New Delhi, the Hambantota deal is bad news because itâ€™s one more step to encircle and pacify India by Beijing. Chinaâ€™s enormous investment in CPEC, and port infrastructure in the Indian Ocean, serves much more than trade. It advances Beijingâ€™s â€œString of Pearlsâ€ strategy, as well as its unofficial agenda to encircle India through its arch-rival, Pakistan. To be fair, the Hambantota port will make it easier for India to trade with Sri Lanka. But it could also be used as a naval station for China should the two countries ever engage in a full-scale war. Meanwhile, Chinaâ€™s growing presence in Sri Lanka undermines Indiaâ€™s efforts to influence the foreign policy of the country. 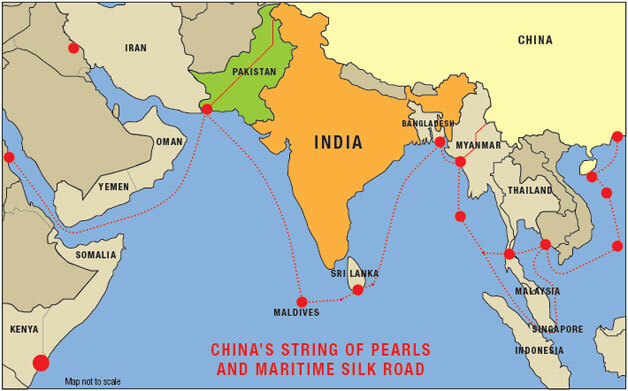 That could explain Indiaâ€™s efforts to contain Chinaâ€™s Indian Ocean agenda by forming alliances with US and Japan, and by performing a joint naval exercise in the Malabar in the Bay of Bengal last July. Still, the prospect of a Pakistan debt problem or an open confrontation between India and China are very unlikely, at least for the time being. Thatâ€™s why investors in the region have chosen to focus more on market fundamentals rather than on the geopolitics of the region, driving shares in all three country markets higher recently. But that could change, if tensions between China and Indiaâ€™s new allies, America and Japan, continue to flare. more than the lure of loans they cannot afford to pay, maybe it's time for the smaller countries to to play china and india against each other? these smaller countries feel bullied by big india, i heard. so they turn to china. brinkmanship, anyone?